The Meteor Shot is Black Mage's Special Shot in Mario Hoops 3-on-3. To perform it, the player must tap out a star shape twice. The star probably represents this as the ultimate black magic. 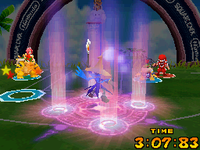 Black Mage begins the shot by creating a large purple rune on the ground. He levitates the ball, now glowing purple, in each of the four cardinal directions, spins, and casts the ball straight up in the air. The screen gets darker and flaming meteors streak down from the sky, including a big meteor which contains the ball. The big meteor slams into the basket, creating a large plume of fire. If shot from outside the 3-point line, instead of casting the ball into the air, Black Mage shoots the ball with his wand. The ball takes on a red glow, with a tangled red ribbon of energy following it. A teammate needs to grab the ball and dunk it in the basket to complete the shot and make the plume of fire appear. The name of the shot comes from Meteor, the ultimate black magic in the Final Fantasy games. This page was last edited on April 7, 2019, at 23:21.